I offer workshops to various groups in and around the Philadelphia area. To inquire about one of these workshops or to explore another, please email me. Clean and plentiful water, without flooding, is essential for a healthy business climate. With recent flooding issues in mind, now is the time to explore the land/water connection. Clean Water Partners’ Business Presentation provides information so that your business choices are based on the best current knowledge. Large or small, businesses can use simple management practices to reduce excessive water runoff and the pollution it carries. Together, we can beat flooding and water pollution. It’s easier than you think. Inquire about waived cost of presentation for Philadelphia Watershed residents. Using an attractive and informative model of a watershed, learn how water moves through our environment, what pollutes the water, and how we can protect the water that we drink. This workshop can be tailored for children or adults. It can focus on sustainable gardening, native plants and invasive species, integrated pest management and poisons in our homes and yards, or storm-water run-off issues. Have a party, reunion, or community event in a natural area or park? Increase your children’s exploration of nature through butterfly catching or other activities appropriate for the natural area of the event. Guided walks, exploration of flowers or trees, bird watching or catching frogs may all be possibilities. Several local parks are recommended, or a location of your choice is welcome. Make beautiful craft paper from recycled paper pulp. This event can be a party activity, a workshop to learn the process of making paper that you can repeat at your home, or an activity that is ongoing at a community fair. 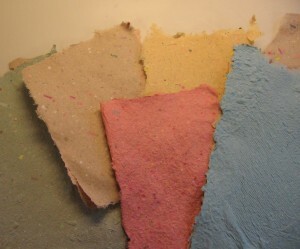 Both children and adults will enjoy making paper. Specific topic on your mind? Ask about sustainable gardening, setting up compost, native plant events, controlling invasive species, Integrated Pest Management or presentations to Sunday school classes and community groups.